A great way to spend time with your dog this winter. You had a great summer, with lots of activities that you and your dog were able to share, and fall was just a cooler extension of the fun. But now winter is beginning to blow its first frosty breaths, threatening to spoil the groove you and you dog have going. The high energy activities don’t have to end with the first snowfall, however. If you live close to an area where you can cross country ski, and your dog is physically capable of spending long amounts of time in the snow, then you may have just found your new winter activity: Skijoring! 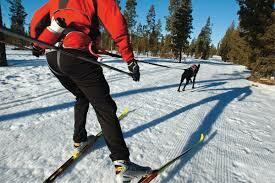 Skijoring, which translates to ski driving in Norwegian, is a combination of cross country skiing and dog sledding. 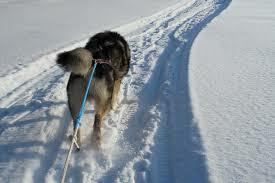 The dog is outfitted with a dog sledding harness, which is attached by rope or towline to a skijoring harness worn by the human. 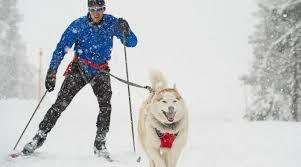 While the human powers him or herself using skis and poles, the dog also pulls the human. This activity can be done with one dog or a team of dogs. As long as your dog weighs at least 35 pounds and has the energy, stamina and willingness to take part, all you will need is some basic training to get started. Which Dogs are Best for Skijoring? 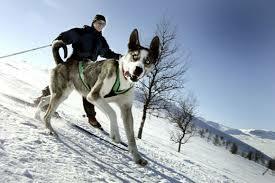 Any dog that loves to run and meets the minimum weight requirement is a good candidate for skijoring. 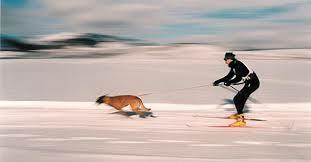 While small dogs are not necessarily excluded from recreational skijoring, they are not often seen participating because they are not able to add much strength or speed. But if you feel that your small dog would have fun skijoring with you, what’s the harm in letting him pretend to pull you with all of his strength? The breeds that do tend to be seen participating in this sport in greater numbers are the Northern breeds, those with heavy hair coats like Canadian Eskimos, Huskies, Malamutes, Samoyeds and Chows. But other breeds are well suited for this sport as well, pulling dogs such as American Bulldogs, mastiffs, American bull terriers and Staffordshire terriers, and high energy and fast running breeds like greyhounds, Labrador and Golden retrievers, German shepherds and German shorthaired pointers. It is best if your dog already has a desire to pull and run and does well in cold weather, but with positive training and the right cold weather gear, almost any dog can become a class A skijorer. It helps quite a bit if your dog is good at not being distracted, since you will not want to interfere with other skijorers, and you will not want your dog to drag you out of your planned route. The best skijoring dogs are those that can ignore the other dogs on the trail and move ahead of them with nary a glance. In competitions, in fact, points are deducted for dogs that are distracted or that interfere with others. The Basics $95.00 per person. Learn the basics of skijoring. A one day experience that covers what you will need for equipment, technique, diet for your canine and skate ski lesson. Rentals available or bring your own skis. Leave your dog at home for this one. He/she is up next. Learn To Chase $65.00 per person. 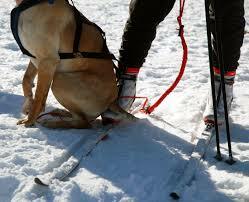 Learn to chase another experienced skijorer is the best way to teach a new dog pace, social skills and commands,. 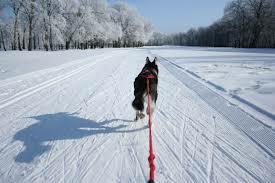 Typically we run on groomed snowmobile trails and skate skiing is the preferred method of skiing. Learn to chase, will teach your dog to become trail savvy and give you, the skier an opportunity to sort out balance, pace and harness rigging. This is a one day experience out on the trails. And bring your dog for this one. 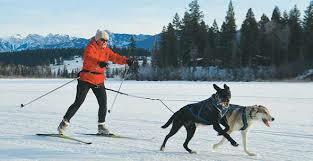 This experience is all about getting out in the wilderness and running with your dog 10-15km to a wilderness cabin with an experienced skijorer. The cabin provides basic accommodation with no running water. However there is a great woodstove and tons of firewood. along with comfortable bunk beds. Bring your own gear including food for you and your dog and a sense of adventure. Day 2 we run a further loop of 20km and return to the departure point.